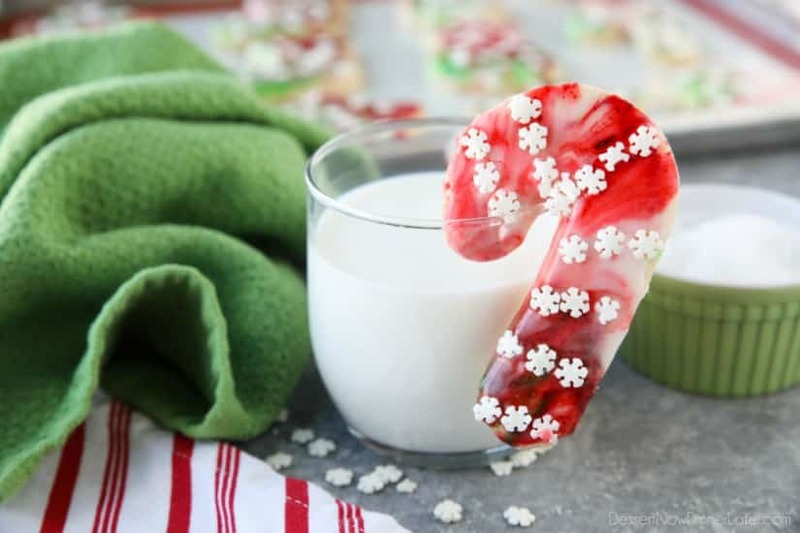 Swirled Christmas Sugar Cookies - Dessert Now, Dinner Later! *Ad – This is a sponsored conversation written by me on behalf of Crisco®. The opinions and text are all mine. Thanks for supporting the brands that make Dessert Now Dinner Later possible. 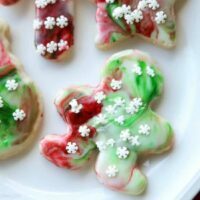 Swirled Christmas Sugar Cookies make cookie decorating easy! 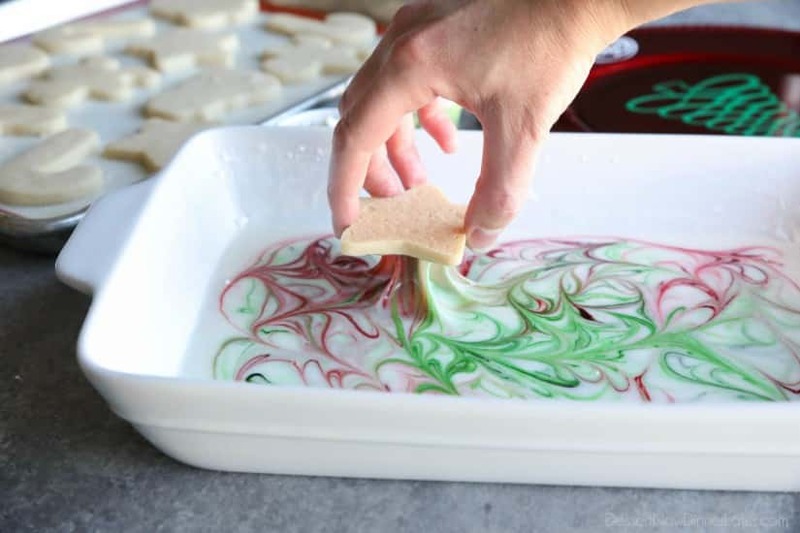 Simply swirl food coloring in a special glaze and dip the cookie! 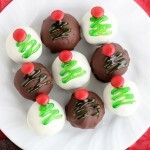 The kids will love making these for Santa! Christmas is a busy time of year, and the kids need to hurry off to bed before Santa arrives. 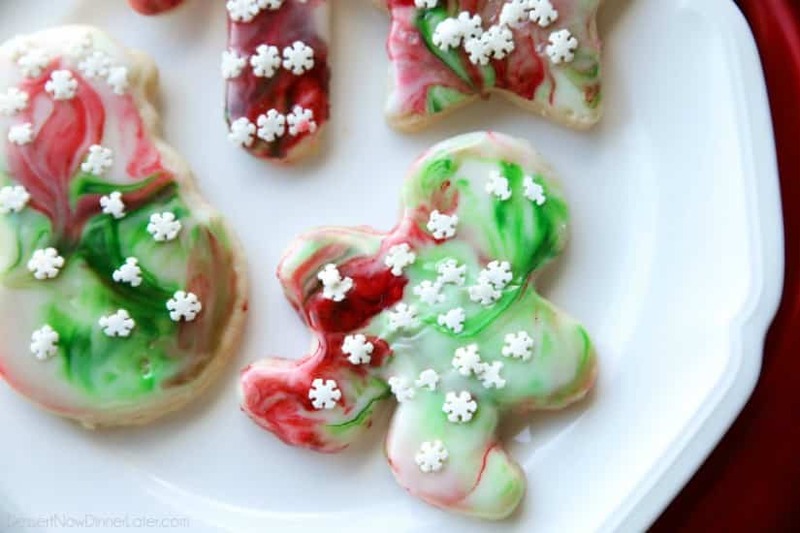 So we skip the fancy hand-piped sugar cookies, and go for an easy special glaze, marbled with red and green food coloring. Add a few snowflake sprinkles and you are all set. 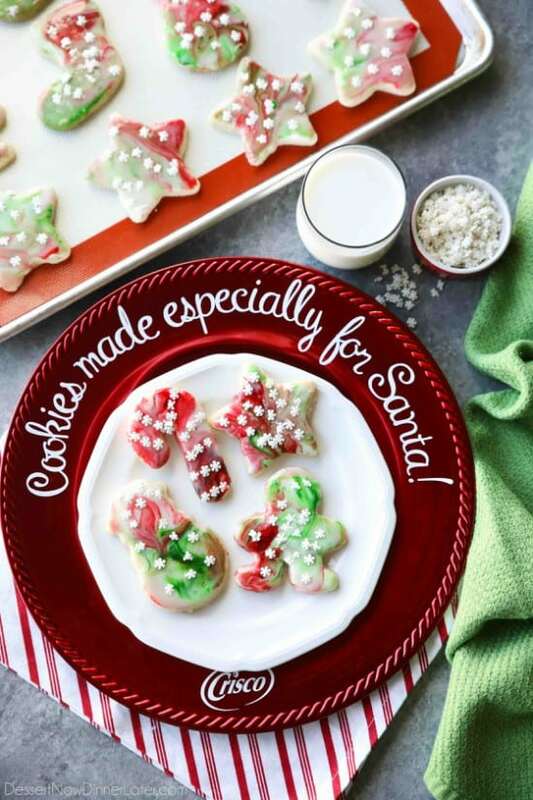 Of course, Santa deserves only the BEST sugar cookies for Christmas. 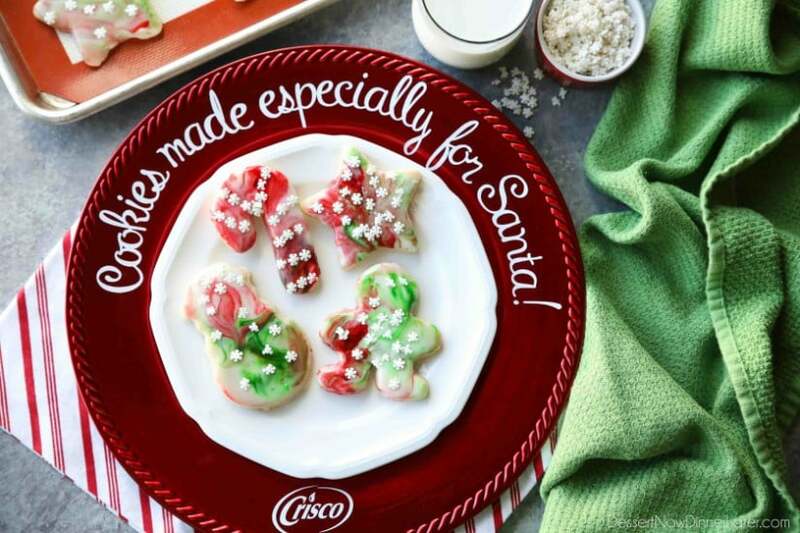 Using Crisco® All-Vegetable Shortening instead of butter ensures that the cookie cutter shape stays intact and that the cookies are thick, perfect for dipping. Plus they are light, airy, and delicious! 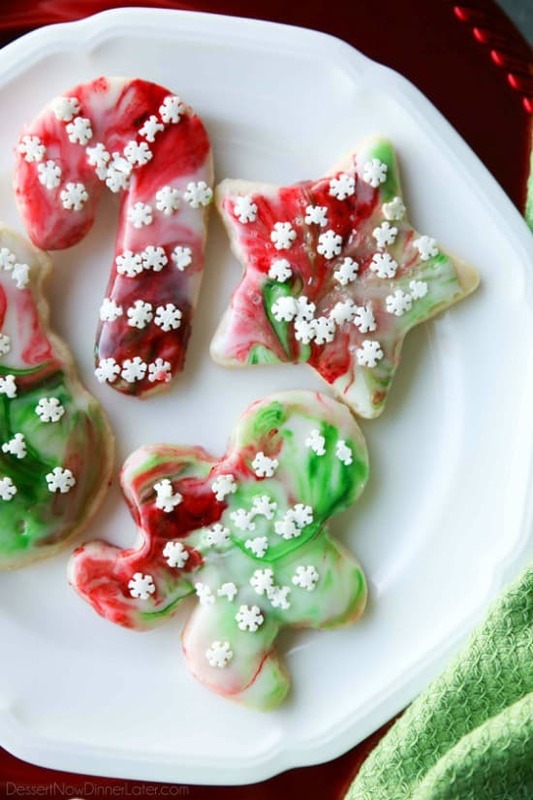 Your kids will love making these Swirled Christmas Sugar Cookies for Santa. Be prepared for sticky fingers. Just keep in mind, messes make memories. This is definitely a hands-on activity for the whole family to enjoy. The best part about this recipe is that each cookie gets its own unique swirled look. It’s like a work of art! 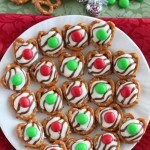 The colors are so fun, and the kids love eating them as much as Santa! 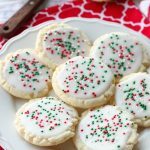 Bake It Better for Santa this year by making Crisco Sugar Cookies, and give this swirled icing a try! Share your creations on social media using the hashtag #BakeItBetter. FOR THE COOKIES: Heat oven to 350 degrees Fahrenheit. Whisk flour, baking powder, and salt in a medium bowl until combined. With an electric hand mixer, cream the shortening and sugar in a large bowl on high speed until light and fluffy. Add the egg, milk, and vanilla. Mix to combine. Gradually blend in flour mixture. Divide dough in half. Roll out each half on a lightly floured surface 3/8-inch thick. 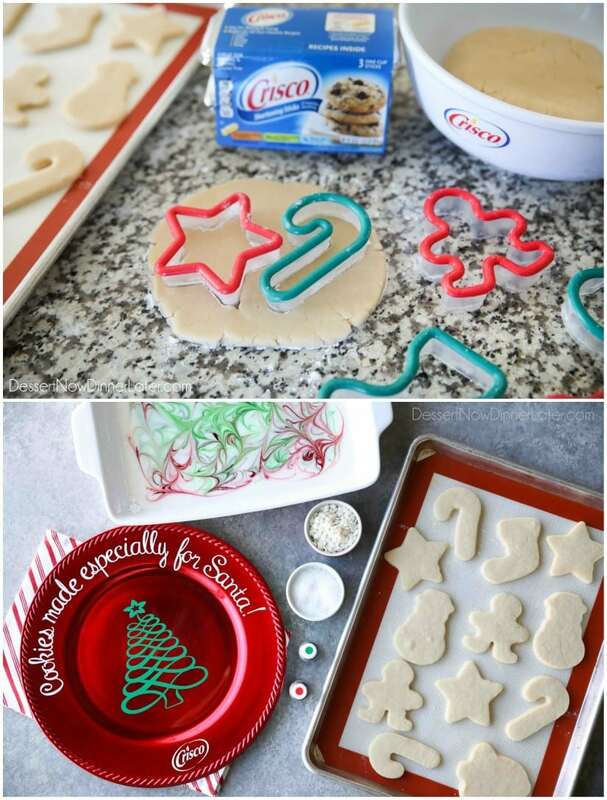 Cut with 2 to 3-inch Christmas cookie cutters. Place 2-inches apart on a parchment/silicone lined baking sheet. Bake for 8-10 minutes, until edges are just starting to brown. Remove from oven. Rest on cookie sheet for 1-2 minutes, then and transfer to a cooling rack. FOR THE GLAZE: Sift powdered sugar into a 13x9-inch baking dish. Add corn syrup, 3 Tbsp of milk, and the almond extract. Whisk together. If glaze is still too stiff/dry, add another Tablespoon of milk. 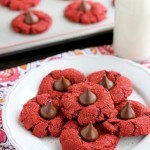 Should be thick, but pourable, and not so thin that it will run off the cookies. If more milk is needed, add it 1 teaspoon at a time. If too thin, add more powdered sugar. *Test glaze with a cookie before adding food coloring, to make sure the consistency is right. Using several toothpicks, dip a little gel on the end of a toothpick and begin swirling through the glaze. Repeat until you have a good mix of red and green. NOTE: Leave a lot of white still showing, because the colors will mix as you start dipping cookies. Working QUICKLY, dip the surface of each cookie into the glaze, lift it up and then transfer it back to a cookie sheet or piece of parchment/wax paper. IMMEDIATELY top with snowflake sprinkles before glaze dries. *If glaze starts to dry while you are dipping, you can wiggle the cookies back and forth in the glaze as you are dipping to loosen it up. Let glaze set. Store cookies in an airtight container. - If working alone, consider separating the glaze into two or three bowls. Only color one bowl at a time as you work, so the glaze doesn't create a film on the top.